A few years ago, “Lucky” decided that he wanted to go on an adventure, and he set off into the forest on his expedition. His owners searched and searched for him, but to no avail never found him. Although his parents never gave up hope of finding him, after 4 months they decided it was time to get another kitten. A few days after bringing the new kitten home, the owners were outside and from across the back yard, they saw a brown tabby walking to greet them. This cat looked similar to “Lucky”, but she was not sure if it was truly him, after all it had been 4 months since he left. His owner remembered that “Lucky” had been microchipped when she adopted him. The owner called our clinic to see if we could scan the cat that she found to see if he was indeed microchipped. Of course we said yes and told the owner to bring the cat right in. Low and behold when the cat was scanned he did indeed have a microchip. The girls from the clinic called the microchip company, gave them the number of the microchip. Luckily for “Lucky” when his owner had adopted him, she registered the microchip with his information. The microchip company searched their database and came up with a cat and owner. 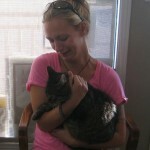 It was in fact “Lucky” that had come home after all this time, and was reunited with his furrever family.